North East Livestock Sales sold 25 prime cattle and 11 cows and 2291 sheep comprising 1575 lambs and 716 cast ewes. Cattle: A small show of cattle was forward this week with harvest and sheep sales tying farmers up. Lim Hfrs 222p, 220p Blagdon Burn, 218p Elyhaugh, 217p Burn Houses. Lim Strs 215p Oak Dene, 208p, 205p Warton. Lim strs 1372, 1357 Warton, 1304 East Coldside, 1267 South East Farm. Lim Hfrs 1306 Blagdon Burn, 1257 East Coldside, 1202 Burn Houses. Cows: A small show this week with mainly lean feeding types forward. Lim x 160p Howick Scar. Bel Blue 155p Warton. Lim x 1187 Warton. Here x 1092. 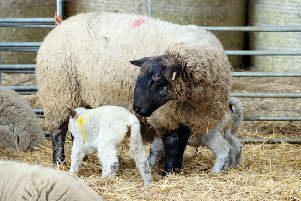 Beltex 216p Little Bavington, 216p Howick Scar, 215p Bilton, Texel’s 209p Howick Scar, 206p Cramond Hill, 200p Little Bavington, 200p Matfen Estates, 200p West Lane End, 198p Longlea. Suff x 94 Craster Heugh, 93 South Bells Hill, 93 Biddlestone Home Farm, 92 Tilesheds, 92 Fowberry Moor. Ewes: ll classes ewes easier on the week with larger numbers coming forward. Texel’s 107, 106 Ashington Gardens, 95 East Fleetham. Suffolk’s 108 Fowberry Moor, 105 Howick Estates, 93 Blagdon Burn, 90 Yetlington, 89 South Lyham. Beltex x 83 South Carter Moor, 82 East Fleetham. Cheviot/Mule 63 Park Farms, Mules 65 Ashington Gardens, 65 Tughall Grange, 64 Pasture Hill.